Windows 7 Build 7600.16385 availability was first known in the midst of the leak of 64-bit Windows 7 Build 7600.16384, and the build is now been said to be the final gold code of Windows 7 RTM. 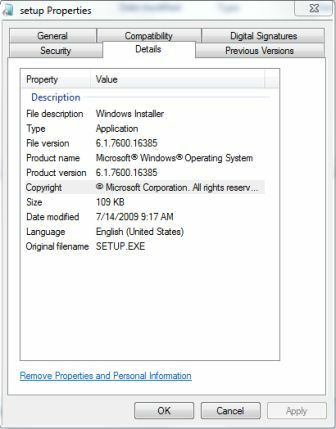 Windows 7 Build 7600.16385 has the full complete build tag string of 6.1.7600.16385.win7_rtm.090713-1255 (7600.16385.090713-1255), indicating it’s compiled on July 13th, 2009. In RTM build, user can now choose to install either Windows 7 Starter, Home Basic, Home Premium, Professional or Ultimate edition. However, none of the original untouched and unmodified Windows 7 RTM Build 7600.16385 DVD ISO images from Microsoft has leaked to Internet yet. Instead, only original installation setup files and folders set that been extracted from the original ISO been made available in RAR archive format. The move is likely to possibility of leakers been tracked by Microsoft as ISO downloaded from Microsoft Connect contains unique identifier to trace the downloaders. Nonetheless, the Windows 7 Build 7600.18365 extracted installation files have quickly been repacked into bootable ISO format with boot loader typically from Windows 7 Build 7600.16384 for easy installation. But there is one side effect, the MD5 and SHA1 hash check-sum for the ISO is no longer the same with official Microsoft’s version, and you have many versions of ISO images available. However, the main Windows 7 installation compenent, install.wim, is the same and will provide similar, if not identical, installation result with official original untouched version. All three parts of the extracted installation files of 32-bit (x86) Windows 7 RTM Build 7600.16385 can be downloaded via torrent: Windows_7_7600_x86_16385.torrent. Windows 7 RTM does not accept Windows 7 Beta product keys or Windows 7 RC product keys for activation. While waiting for Windows 7 to be officially launched (GA – General Availability), or been posted to MSDN or TechNet Subscriber Downloads, end-user can use the rearm command to reset activation grace period to up to 120 days, and check out all information and FAQ related to Windows 7 RTM.